Every Saturday there's a tour for Jewish residents inside the Kasbah, encircled by the IDF. A very boring guide leads the tour. 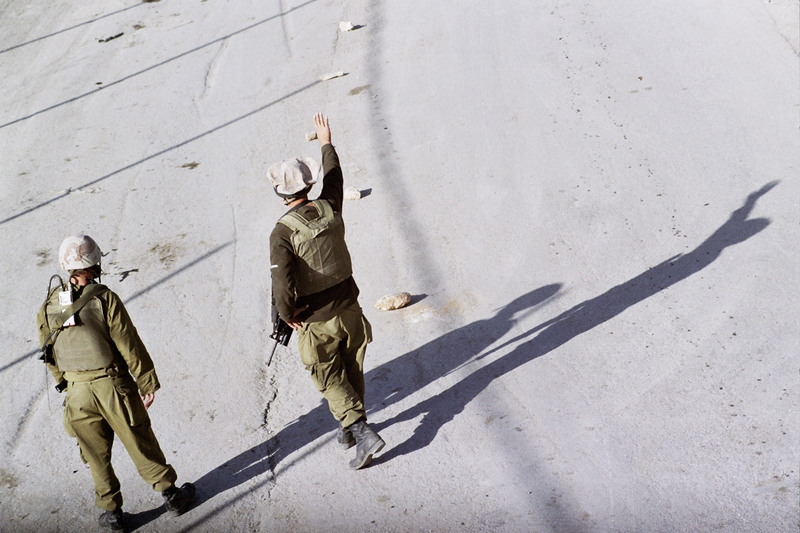 They [the IDF] decided to allow it, and anyone who wants [to come] – it's completely open. They open the gates in an organized group, secured and confined, they walk inside the Kasbah. He [the guide] stops at some spots and points: "there was a Jewish house right here, there was a Jewish house right here," tells a story here, "there was a terror attack here," and they leave. Once, a group of teenagers from some Yeshiva started singing in the middle of the Kasbah “David, King of Israel, lives and endures” (a well-known Jewish folk song) and were dancing in a circle. They were immediately stopped and kicked out [of the Kasbah] and it had backing. We understood that if Jewish guys within an Arab neighborhood, within the Kasbah, were now to do this, it’s spiteful, it's like coming and giving you the finger in your face. We didn’t want it, and they were kicked out. And the tour itself – isn't it spiteful? Maybe it has that as well, but it wasn’t my call to decide whether there’s a tour or not. My mission was to secure the planned tour. How many people take part in such a tour usually? Around 50 people. What are the preparations as far as you are concerned? First of all there’s always a securing force that walks ahead [of the tour], checking that there’s nothing suspicious. There’s one patrol ahead and one patrol that splits up between the front and back of the force. When they stop, they’re always encircled somehow. And we try to avoid blocking routes as much as possible, to minimize how bothersome it is (to the Palestinians). In the end, some dumb kid passes by a stand, and, just to spite the owner, turns something over. We shout at him and kick him out. After that he comes and apologizes, but it happens. These things have happened. Does it make any difference? I mean, the following Saturday there won’t be any tours after this kind of incidents? It makes a difference to the local population in the Kasbah, the Palestinians and the Jewish community alike. Their lives are deeply affected by a battalion commander 30 and company commander who determine their conduct and the conduct of their tours. Their lives are deeply influenced by it - the general atmosphere and the day-to-day.